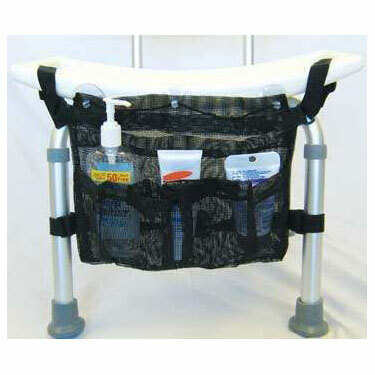 This handy bathing pouch from Drive Medical attaches under a bath bench, under a transfer bench or as an attachment to the wall. Large storage pockets provide space and convenient access to hold many personal items needed during bathing. The vinyl mesh material is breathable and allows water to drain. The 10 x 13 x 1 pouch attaches without tools and is machine washable. This product comes with a 90-day warranty. Easily attaches under bath bench, transfer bench or attachment to the wall. Large storage pockets allow for added convenience. Size: 10" x 13" x 1".